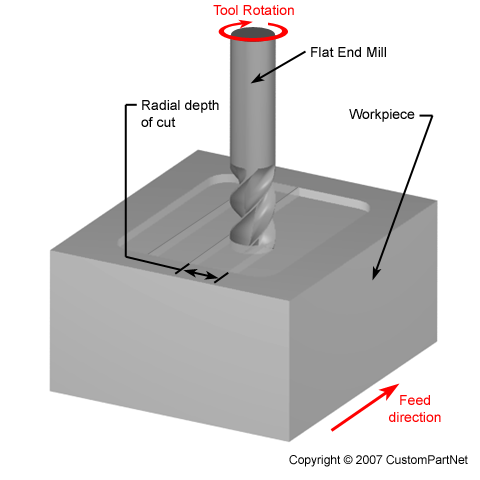 The depth of the tool along its radius in the workpiece as it makes a cut. 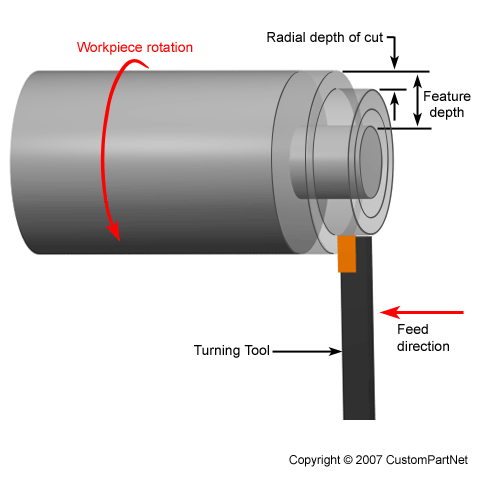 If the radial depth of cut is less than the tool radius, the tool is only partially engaged and is making a peripheral cut. If the radial depth of cut is equal to the tool diameter, the cutting tool is fully engaged and is making a slot cut. 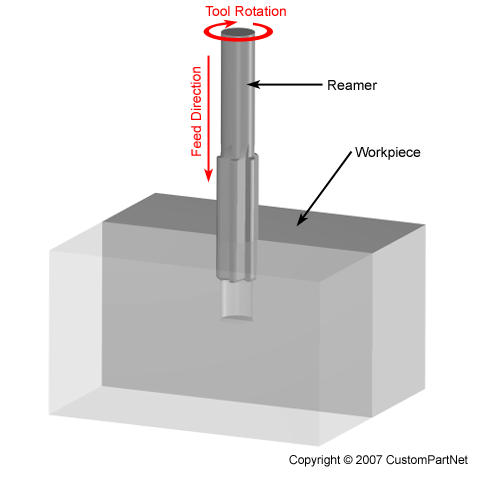 In turning and boring operations, a single-point tool cuts at a depth relative to the workpiece radius. 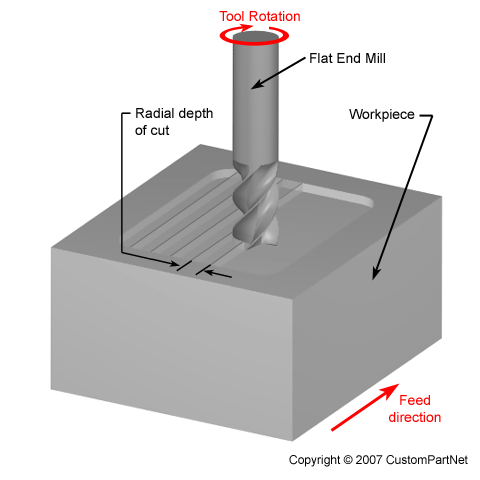 A large radial depth of cut will require a low feed rate, or else it will result in a high load on the tool and reduce the tool life. Therefore, a feature is often machined in several steps as the tool moves over the step-over distance, and makes another cut at the radial depth of cut. Tooling for molding or casting processes that is quickly manufactured through high speed machining of aluminum or soft steel, or by using additive fabrication techniques, such as FDM or DMLS. Rapid tooling is often used in low volume production, where low cost tooling greatly reduces the part cost and a lower tool life is not a factor. The speed of the cutting tool, measured in inches per minute (IPM), when it is not engaged in the workpiece and rapidly moves from one position to another. The rapid travel rate is used to move between features as well as moving to and from the tool changing position. 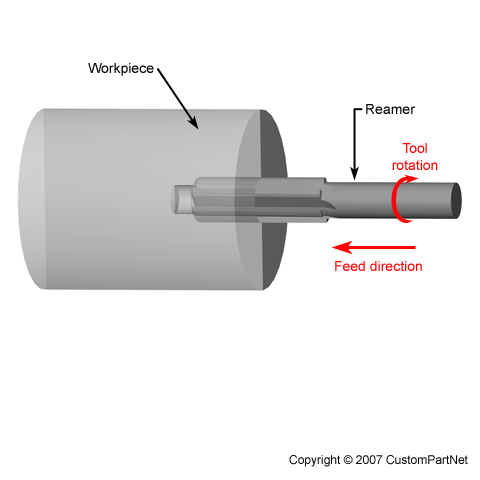 An operation in which a reamer enters the workpiece axially and enlarges an existing hole to the diameter of the tool. 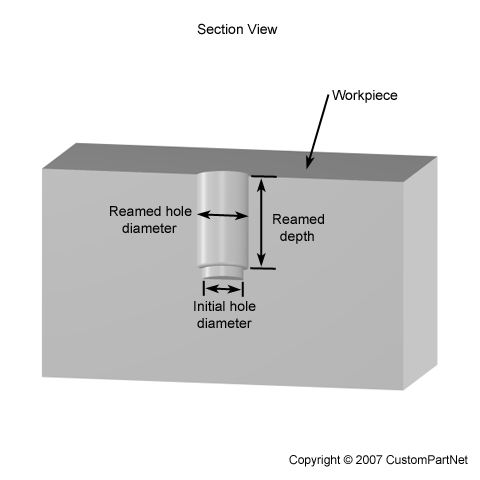 Reaming removes a minimal amount of material and is often performed after drilling to obtain both a more accurate diameter and a smoother internal finish. A finish reaming operation will use a slower cutting feed and cutting speed to provide an even better finish. The cost of reconditioning scrap material to the proper chemical composition before it is reused, measured as a percentage of the original material cost. In many processes, scrap material is generated from mold feed systems or defective parts and can be recycled by mixing it with unused material. The recycle ratio is the amount of scrap allowed to be recycled relative to virgin material. The scrap allowed to be recycled by this ratio is often less than the available scrap, resulting is some material waste. The ability to withstand heat without deforming or melting. Many clays, minerals, and even some metals are considered refractory materials. Regrind refers to scrap material that is reground into pellets and then mixed with unused material for reuse. The regrind ratio is the allowable amount of regrind relative to virgin material. The scrap used for regrind can be generated from the mold runners and defective parts. The cost to regrind this material may include both equipment and labor, but should be less than the cost of raw material. Remelt refers to scrap material that is remelted and then mixed with unused material for reuse. The remelt ratio is the allowable amount of remelt relative to virgin material. The scrap used for remelt can be generated from the mold runners and defective parts. The cost to remelt this material may include both equipment and labor, but should be less than the cost of raw material. A thin wall protrusion on a flat surface of a part, usually found in parallel clusters, that adds bending stiffness to the part. A chamber attached to the runner system that fills with molten metal during injection to provide an additional source of material during cooling. When the part cools, the molten material will shrink and additional material is needed. Measure of resistance to penetration when material is exposed to a pointed load. The Rockwell Hardness measurement produces hardness numbers related to the depth of residual penetration of a steel ball or diamond cone (brale) after a minor load of 10 kilograms has been applied to hold the penetrator in position. Under this condition, the major load is applied (either 60, 100 or 150 kilograms). This residual penetration is automatically registered on a dial when the major load is removed from the penetrator but the minor load is still applied. Various dial readings combined with different major loads, five scales designated by letters varying from A to H; the B and C scales are most commonly in use. For testing hard steels, a sphero-conical diamond is used with a 150 kg load, the result is read from the black scale on the dial and is prefixed with the letter C. A hardened tool steel would typically give a reading of 62Rc. For softer metals Scale B is used with a 1/16" diameter steel ball and a standard load of 100 kgs. A channel in a mold that delivers the molten material to the mold cavities.